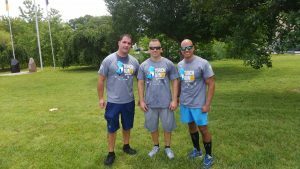 Avalon Officers Run in 2018 Law Enforcement Torch Run – AVALON POLICE DEPARTMENT N.J. The Avalon Police Department participated in the Annual Cape May County Chapter, Law Enforcement Torch Run on Friday June 8th. The mission is to raise awareness and funds for the Special Olympics movement. The run starts in Cape May and finishes at the Cape May County Police Academy. Sgt. Robinson ran 20 miles, starting in Wildwood Crest. Chief Christopher and Sgt. Sykes ran almost 7 miles starting in Stone Harbor.